White River Division: GMD Recollections- Nice Paint Scheme! GMD Recollections- Nice Paint Scheme! EMD 7014/7013/7020 await the next westbound freight at the CP yard in London, Ontario. The date is March 13, 1995. EMD/GMD demonstrator units sported a wide variety of paint schemes over the years. To my mind, this was one of the best. During this time period, GMD deliveries were handled by either CN or CP in London. 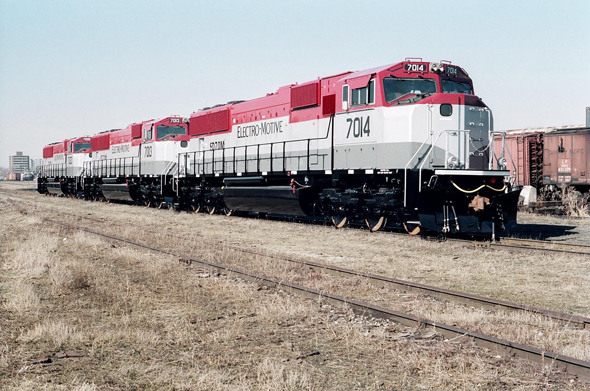 These SD-70M units were caught at rest in CP's Quebec Street Yard. During the final years of operation of the plant, all units were picked up by Goderich Exeter Railway and delivered to CN either at London or Toronto. Revisiting Jim Sloan’s JSSX Shortline Railroad. My Springfield 2019 trip canceled. The NEB&W - The end?